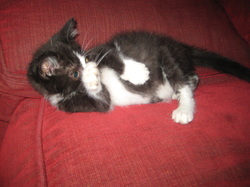 Tuxedo Jack is one of 17 kittens rescued from a hoarding situation. At that time, he was about two weeks old, and had an incredibly infected eye. Two days after being rescued, the infected eye ruptured, and he was rushed to the vet to have it removed. 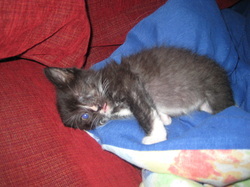 Since he has only had one eye nearly the entire time his eyes have been open, he is remarkably well adapted. When he and his sister Talon play, nine times out of ten he wins! Like many bottle-fed babies, he is incredibly loving towards people, and will nuzzle your neck before he falls asleep. He loves to be part of whatever you're doing, especially if it involves a book!